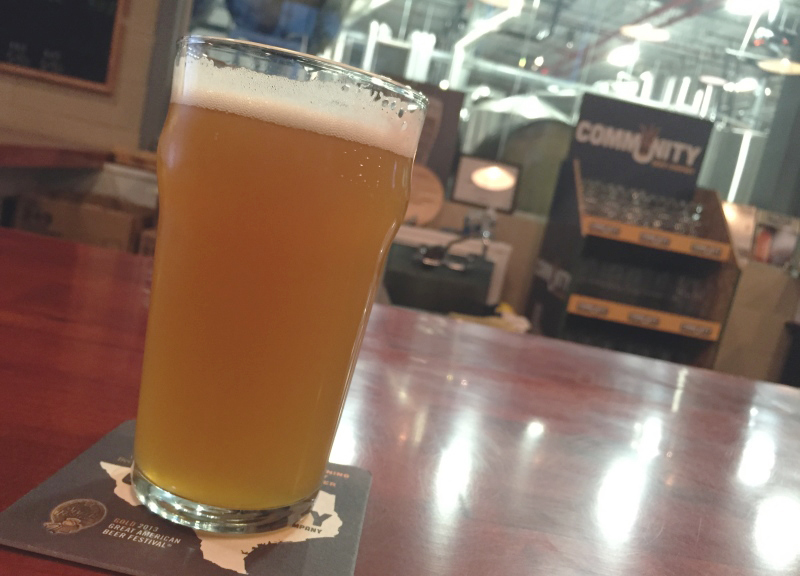 Community's Funnel Cake Ale Is A Creative, Not All That Funnel Cake-Like Blonde Ale. This week we sipped on Community Beer Company's Funnel Cake Ale. • Style: Blonde Ale (English Summer Ale). • International Bitterness Units (IBUs): 15. • Availability: Special release for the State Fair of Texas. 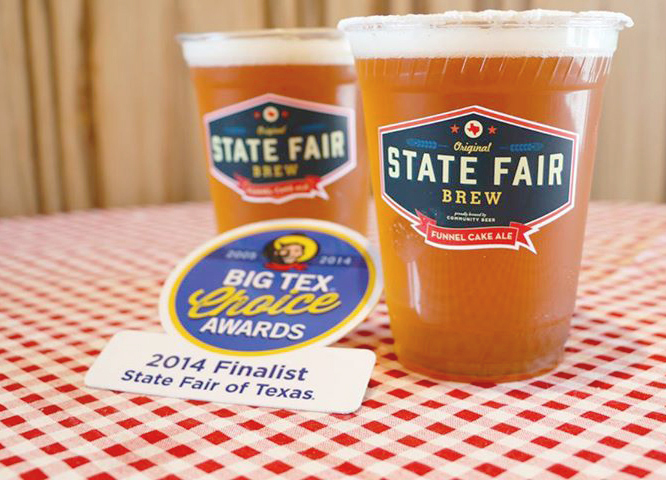 Unless you've been living under a rock, traveling through foreign countries or otherwise completely ignoring Dallas food and cultural news, you've no doubt heard that the winner of the coveted “Most Creative” title in the 2014 Big Tex Choice Awards was Community's Funnel Cake Ale. Further, the team wanted to make sure that the brew had funnel cake components without being too sweet and while maintaining a sessionable edge so fair attendees could enjoy a few without getting too sloppy. There aren't any plans to brew this beer again, so get your fill at the fair — especially if you're jonesing for the powdered sugar rim — or right now at Community's tap room while they still have it. For an overview on blonde ales, be sure to scope this review of Revolver's High Brass. Funnel Cake Ale pours cloudy blonde — and cloudy may be an understatement, because it's practically opaque. There's a medium-sized, creamy white head which fades into the glass quicker than expected. Funnel Cake Ale is full of really interesting aromas — quite funnel cake-esque ones, to be sure. More specifically, there's some powdered sugar, vanilla, accentuated sweetness and a slight hint of fresh grain. This is where the funnel cake comparison kind of breaks down. Where I expected something along the lines of the aroma — sweetness, powdered sugar, grain — I get none of that. In fact, except for a bit of a heightened sweetness on the back of the tongue, there's not much different here from a standard blonde ale. There's also a surprising hop backbone in this beer — it's bitter, but not overly so, and enough to support a medium to medium high malt profile. Everything seems well-balanced, though the efforts to produce some of that funnel cake sweetness feel a tad forced. 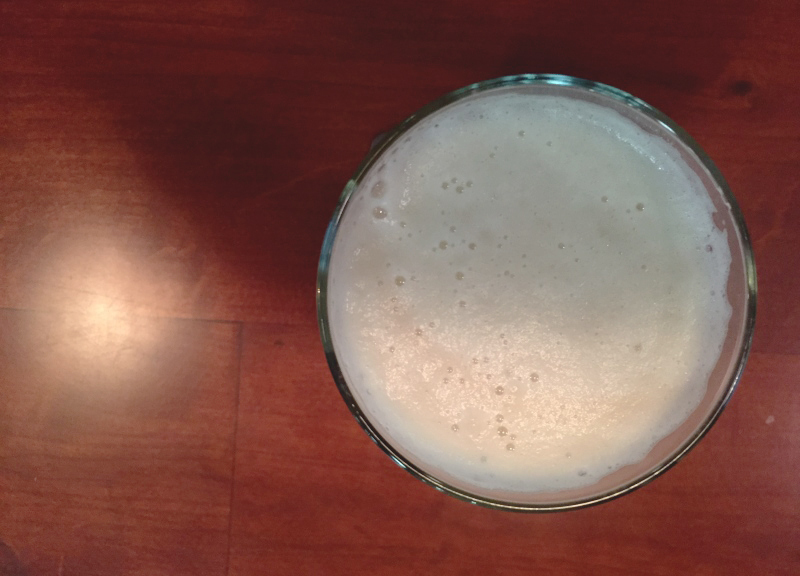 Funnel Cake Ale has a medium mouthfeel with an adequate level of carbonation. I went into Funnel Cake Ale expecting an overly sweet novelty beer — something that would sell well at the State Fair of Texas while if not exactly catering to the typical craft beer nerd. Perhaps, in that regard, this beer suffices as a gateway beer. But I wouldn't go much further than that. The aromas are where this beer really shines. Those notes of vanilla, powdered sugar and grain are what sells this beer as being funnel cake-inspired. All the other components are, well, just a good, well-balanced beer but nothing to go nuts over. What's disappointing is that the actual flavors don't hit where the aromas do. Viewed through the lens of an English Summer Ale, the flavors are mostly spot on, sure. But their embellishments — specifically, the slightly sweet finish — feel shoehorned in so that the beer could maintain its funnel cake cred. While that may be the point of the beer, it doesn't mean it always work. And, unfortunately, it's the finish that would probably keep me from wanting to drink more than one. Still, credit where it's due: Funnel Cake Ale is certainly deserving of the “Most Creative” award win at the State Fair of Texas. It's a creative beer that's mostly on point with its execution, and an offering that's certainly a nice change of pace from the typical fried food bonanza we face this time of year. Should you find yourself in Fair Park or in the Community tap room over the next few weeks, try one — and just one, as that will probably be all you need. On a scale of 1-10, I'd give Community's Funnel Cake Ale a 7. • Thursday, October 9, through Thursday, November 20. Brewhaha Comedy Tour at Various Local Breweries. • Saturday, October 11. Cyclesomatic Swaptoberfest at Community Beer Company. Next ArticleCut To The Chase.